Makes sense to me, anyway. And as I get excited about the concept and its potential, I worry that The Bristol Cable isn’t good enough. Of course it takes time and resources to build the thing, and it’s not always helpful to have co-owners being a nuisance. But I’ve written some things, meant with the best intent, and hopefully useful to someone — whether the Cable or another media co-operative somewhere. I think the big risk is that the Cable fails because of execution and then the co-op model takes the blame. 1) *What is the Cable? And what is it trying to do? 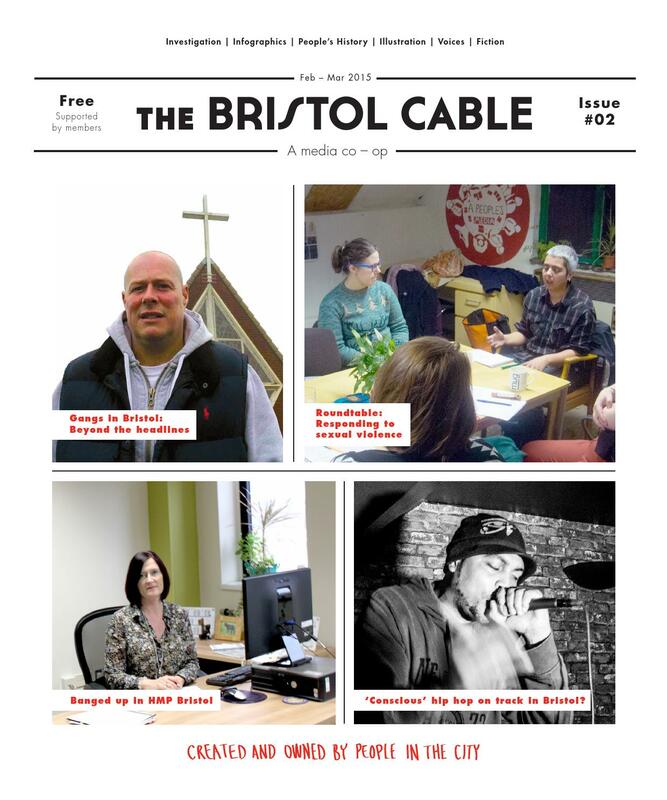 Is The Bristol Cable a newspaper? Is it a current affairs magazine? Is it a quarterly news review? And if it is any of those things today — what is the vision for it for tomorrow? Unless it can clearly answer those questions, it won’t be able to target audiences or identify competitors, which will help it to grow. Furthermore, what does success look like for the whole organisation? Beyond readership, though that’s a good indicator. What is the desired social impact of a local media co-op? What good is it doing Bristol? The Grenfell Tower disaster might serve as an example. If the fire was partly due to the absence of strong local journalism to hold the council to account and to press them for preventative action, then how would a world with co-owned media be different? Can the Cable prevent a similar disaster occurring in Bristol? How can we judge the Cable’s ability to provide journalism that represents the voices of less privileged people and that holds local decision-makers accountable? At the meeting last week, the Cable coordinators presented the story of their work with the Bureau Local on mega-farms. It was all good stuff. The members responded to the talk with a bunch of ideas for related writing or investigation, each building off each other. But what becomes of those ideas? Do they go into an editorial meeting somewhere? Or are they lost in the ether? It made me realise that the Cable might be working the wrong way round. A cooperatively owned media organisation could be the publishing platform for its 1,700 members. Instead of seeing the members as just the means to an end, i.e. they provide the monthly donations to keep the show on the road, what if the Cable saw those people as a newsroom of 1,700 staff? People who could help with writing, production, proofing, producing etc… I got the sense that the coordination team were open to this, but that member involvement would be the exception, not the norm. The Cable does already run journalism training for locals, which is exactly the right approach — hopefully this will be followed through to its logical conclusion. The coordinators may be concerned by the risk of being overwhelmed by volunteers, to which the answer is ensuring that there are no bottlenecks. This happens by working openly, to ensure that 1,700 have the same access to information as the central team, which allows members to self-organise to help the paper as best they can. That might look like open editorial meetings, where members contribute and critique story ideas. This would give the paper more stories to choose from, which leads to better content overall. Stories themselves could be drafted in the open, or at least open to the membership if not the public, so that another twenty pairs of eyes can review them for errors — and ten more brains contribute additional local knowledge to the story. Again, this leads to better quality content. This stuff is often easier said than done. Openness does not guarantee involvement: people are busy or might not understand what they can contribute. But it would allow the real keen ones, the early adopters, to help out — and they’ll iron out the problems and help bring more members on board. It’s about taking down the barriers to engagement that most organisations naturally create. Organisations get an office, ‘their office’, they set up email and WhatsApp groups: closedness happens by accident, by default. You have to work at openness. One quick win might be a Cable Slack channel — it’s the easiest way to be notified about things, such as editorial meetings, as they’re happening. I’m tempted to just start one for the members, but suspect its better to all be in one place (the coordinators have one already). I’m a relative newcomer to the Cable. I assume there were conversations when it started about the need for an editor. And I’m not sure how these went down. Perhaps it was felt that a cooperative should be all about horizontal communication and organisation, so having an editor felt wrong? Who knows. But the Cable needs an editor. Think orchestras and conductors. Football clubs and coaches. They can manage without one, but they’re unlikely to get good results. Particularly if the Cable can move to a place where its members are the main contributors. Editors then become the most important part of the coordination role. The print version of the Cable is a bit of a mess. It would benefit from one clear-minded person to take responsibility for it. That person should establish and ferociously guard the Cable’s standards, the quality of writing and sourcing. That person should help everyone else in the coordination team to raise their game. And that person should be ultimately responsible — and be held accountable for — the quality, accuracy and effectiveness of the paper. I don’t know enough about the online content to know if it makes sense to divide the roles into print and online, but I suspect one overall editor would be best. More on the front page… Protect the masthead! Part of what the Cable is trying to do is to build a new trusted brand. And so it needs to ruthlessly protect that brand — not allow, as above, illustrations to run under it or illegible red ‘stamps’ to interrupt it. The masthead is the standard, the flag — and in previous editions it has looked really good, where it is given space to breathe, see e.g. Issue 2. And more still… The front page font has also changed in this issue — perhaps in attempt to relate to the headline story? — which should never happen. There is a Cable font and it needs to be used consistently. (Meanwhile, the back page is great — a clear advert for the Cable, using the right font in a readable size). Last thing on the front page… Nothing about the front-page design or copy feels relevant to Bristol. I doubt the salience of dodgy clipart of Dell laptops and a guy with blue coming out of his head. I think there needs to be something obviously Bristol-related on the front page of every issue. It’s a local newspaper, so celebrate and emphasise the local — that’s why people are going to pick it up. Relate the headline story to an image of Bristol somehow. Consistent design. The paper mainly has a four-column format, but sometimes this goes down to three. And on page two the credits have four columns, but the welcome text is in one giant block. More care in colour use would be great too — the white text on green (p. 9) is particularly hard to read. The job of the paper is to help people consume information — anything that makes this harder should go. Consistent content. This will obviously rely on contributions and resource, but the issues I’ve seen so far are a bit of a random jumble of content — an investigation, a photo essay, another bit of investigation. My guess is that readers would like a little cohesion in the structure of content — like a more traditional paper. News sections, letters to the editor, hyperlocal area news, comment / discussion pieces separated from news. And, of course, the most important stories towards the front of the paper. This also comes back to the question of whether it’s a newspaper or a magazine. Quality of writing. A reader should be able to get a good sense of the story from the first two paragraphs. The TL;DR in internet-speak. And it’s just good writing. The rest of the word count can be used to elaborate and provide evidence. Readers should not have to deal with weasel words, cliches or vague writing, which appear throughout the paper. Photos vs illustrations. This might be my personal preference, or my misunderstanding of what the Cable is, but I find the illustrations odd. Photographs seem correct for a newspaper, certainly for the front page and news articles. But photos would add value to features too; the two-page story on Arron Banks in this issue should have been accompanied by a photo of him. It would be valuable to think about how the Cable could run experiments with the print edition to test some of these questions. But that’s another blog post. Length. The paper seems too long. Again this might be my preference, but consider how much time people spend with a free-sheet: perhaps ten minutes on the bus or in a cafe? I think the coordination team are thinking of going up to 40 pages, but I would much prefer a more regular, shorter, better paper. That also might mean we can use literally better paper — not that stuff that all newspapers used to print on, where it’s difficult to turn individual pages. Fun. Lord Reith was right: you’ve got to entertain, as well as educate and inform. Otherwise it all gets a bit dry. A bit too much like school. One thing at the AGM stuck with me: a co-owner saying “when you get home, you see the Cable and B24/7 [an attractively presented monthly listings magazine that relies on advertising] — and you read the easy one”. I think the Cable needs to provide a bit more fun — a bit more of a celebration of Bristol — or spaces for hope, at least — as well as the investigations of the bad stuff. Perhaps at least a crossword. As a fellow owner, I think The Bristol Cable should also try to do more journalism and less propaganda. The last print version ran a piece on Somalis in Bristol that quoted one Somali as saying that “no matter where you are in the world, every Somali treats you like a brother” or similar. Coming from a member of a nation that’s been embroiled in a horrendously brutal fratricidal war since the early 1990s, that’s steep. For the Cable to run that quote at face value is an insult to readers’ intelligence. In essence, a small group of university-educated individuals decided that it was time to do something to polish up the image of a local minority group, and then used grant funding and financial support from 1,700 other university-educated (and hence, by definition, middle-class) individuals to ram a completely unnuanced, one-sided puff piece down the throats of 30,000 fellow citizens. Is that what democratic news media looks like? Is that the kind of media landscape we want to see?